There are many types of Italian coffee, each of them being delicious and full-flavoured. You can enjoy each type at any time of day, but traditionally some types are drunk at certain times of the day. We'll go over the types of coffee you'll find around lake garda and explain what each one is like, so you'll be prepared when you see them on the menus! 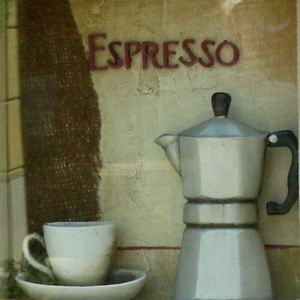 Caffè: a small cup of very strong Italian coffee (espresso). It is always drunk black and quite bitter-tasting, but you can add lots of sugar to take away some of the strength! It's traditionally drunk in the evenings, after a meal. Caffè Americano: This is basicly espresso that's been watered down to make it more like 'American' coffee...but different tasting and still quite strong! It's served in a large cup, and can be drunk anytime...it's kind of geared towards the tourists that can't handle espresso (like me!). Caffè Corretto: Any type of espresso or coffee with a shot of grappa, cognac, or other spirit. Usually drunk after dinner. Caffè Doppio: Double espresso, for those who can really take their caffeine! Caffè Freddo: Iced coffee. Great for sitting by the lake and cooling down on a hot afternoon! Caffè Hag: Decaffeinated coffee...I'm afraid it doesn't do me much good! Caffè Latte: One-third of espresso (about 30 ml) mixed with hot milk and served in a glass. 'Latte' means milk. Usually only drunk at breakfast. In some places, this coffee type is unusual (Italians hardly ever have milk in their coffee); once when I asked for a caffè latte, the waitress gave me a puzzled look and came back with one cup of espresso and one cup of hot milk! Caffè Macchiato: Espresso "stained" with a drop of steamed milk. It's kind of like a small version of a cappuccino. Again, usually a morning drink (one of my favourite types of Italian coffee). Caffè Marocchino: Espresso with a dash of hot milk and cacao powder. Usually drunk in the mornings. Caffè Stretto: Espresso with less water for the seriously brave! This will give you a major caffeine kick! 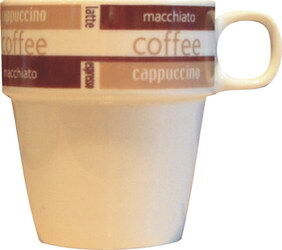 Cappuccino: Espresso infused with steamed milk and served in a large cup. It's always drunk in the morning, never after lunch or dinner. Granita di Caffè con Panna: Partially frozen coffee with ice, similar to a slush, and topped with whipped cream. Lovely in the afternoons!